Jodie died at the scene of the attack in St Neot's Road, Harold Hill, at about 21:30 GMT on Friday. 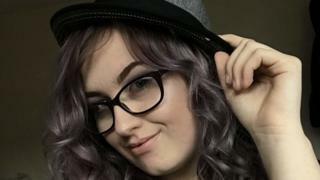 The Metropolitan Police said Jodie had been playing music with five other teenagers in a park when two males walked up to the group and one stabbed her once in the back. They ran off towards Retford Road. Officers said the pair had been seen in the park about half an hour earlier but had not spoken to Jodie or her group of friends. The force said Jodie's attacker was a black male in his late teens but gave no further details, and said there were no descriptions of the second suspect. Det Ch Insp Dave Whellams urged any witnesses who had not spoken to police yet to contact him. "There has been excellent support from the local community and a number of people have shared information with police, but there will be other witnesses and people with information that may prove crucial. "Although the description of the suspect is limited, I am certain that people will have seen the two males hanging around the park or running away from the scene - or will otherwise have noticed something suspicious. I need those people to call me." Jodie was earlier described as a "bundle of joy and such a good person" by one classmate, with another telling BBC News: "She was so beautiful - inside and out. "She was kind, wouldn't hurt anyone and would do anything to make anyone happy." Acting Det Ch Supt John Ross said: "Yesterday a 17-year-old girl lost her life, and I want to express my deepest sympathies to [Jodie's] family and friends. "Her death is a tragedy. I can reassure them and the whole community that we are doing everything possible to identify and bring to justice the person or persons responsible. "It is days like these that really do highlight how we must continue to work tirelessly with our partners and the public to tackle knife crime." Image caption Flowers were left at the scene, with one message reading "RIP Angel"
Jodie's family have issued an appeal on social media for witnesses to the attack. Her grandmother, Debbie Chesney, wrote on Facebook: "How have we come to this point where kids can't have a walk in a park without suffering an unprovoked attack? "If anyone knows anything about this please contact the police with information. "We don't want anyone else to go through what our family is suffering right now. This has to stop, there are too many young people having their lives cut short by needless violence." Police sealed off the area, known locally as Amy's Park, and conducted forensic searches, but no arrests have yet been made. The teenager's death comes less than a week after 20-year-old Ché Morrison was stabbed to death outside Ilford train station in east London. Knife crime in the capital: Can Chicago's model cure the violence? The number of hospital admissions due to "assault with a sharp object" in England was at its highest for at least five years in 2017-18. Data published by NHS Digital shows 4,986 admissions for that reason, rising 15% in one year. A quarter of admissions (1,200) were of people from London. The North West saw 710 admissions.